I designed Bruise Strain & Tear Repair™ for my kids. Dillon is into football and Colin is a wrestler and Lacrosse player. Those two and their friends can sprain ankles, knees, and wrists faster than you can say “It’s a goal!” They need to get healed and back into the game before the coach forgets who they are. Bruise Strain & Tear Repair™ helps to relieve the discomfort and supports the body’s healing process until it’s completely healed. It’s better than ice, better than heat and Don’t even think about using Ibuprofen, that stuff just stops the healing process dead. My older friends love it too. When we get older, we don’t heal as quickly and we need something to keep the generation of reparative tissue going for weeks not days. I have seen this product astound doctors with how quickly severe damage heals. I’ve seen this product aid the body to repair Plantar Fasciitis that had resisted healing for years. If Brent Favre used this stuff he just might come back for another season. Tennis elbow, rotator cuff, bruises, knees… There isn’t an athlete alive that doesn’t need this stuff. It should be in every Gym and every gym bag. Get a bottle for you and a bottle for each of your friends. They’ll love you for it. Remember now, there is more healing to be done after the discomfort goes away. We’re after a complete recovery so it doesn’t fail again. 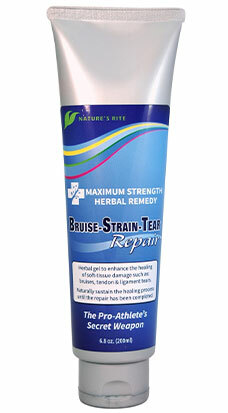 Use Bruise Strain & Tear Repair™ liberally 3 times per day for 4 weeks if it’s chronic or severe. Your body can usually completely heal minor bruises in a week or two with the support of Bruise, Strain, and Tear Repair. Take a few grams of Vitamin C per day and plenty of Vitamin D during the entire healing process to support the creation of new collagen.